Motor vehicle crash injuries sent more than 2.5 million Americans to emergency rooms in 2012, according to a recent report conducted by the Centers for Disease Control and prevention. The report also shows that nearly 200,000 were hospitalized due to motor vehicle accidents. 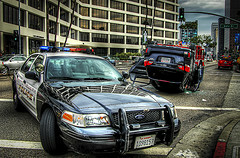 This breaks down to about 7,000 people being admitted to emergency departments every day in 2012 due to car accidents. The lifetime medical expenses for those crash injuries totaled $18 billion. That number includes $10 billion for those admitted to hospitals and $8 billion for patients treated in ERs and released, according to the Oct. 7 Vital Signs report by the CDC. The report also found that work lost over a lifetime due to auto crash-related injuries in 2012 cost around $33 billion. The average total cost of each auto accident-related ER visit was $3,300, and $57,000 for each hospitalization. The report adds that more than 75 percent of costs occur during the first 18 months after the injury. Teens and young adults, between the ages of 15 and 29, have a much higher risk for motor vehicle-related injuries and accounted for nearly 1 million of such injuries in 2012, or 38 percent. People over the age of 80 had the highest hospitalization rates. One-third of those over the age of 80 injured in car crashes ended up hospitalized, according to the report. Not all the news in this report was bad. In fact, there were nearly 400,000 fewer ER visits and 5,700 fewer hospitalizations for crash-related injuries in 2012 than in 2002. This translates to nearly $1.7 billion less in lifetime medical costs and $2.3 billion less in lifetime lost work costs. Many collisions in Citrus County and the surrounding areas are caused by driver carelessness and recklessness, including speeding and distracted driving. Moreover, the frequency of drunk driving and cell phone use, including texting while driving, have reached serious levels. A Citrus County Auto Accident Lawyer at Whittel & Melton can fight to obtain the maximum compensation possible for you if you were injured in an auto accident. Our Personal Injury firm has a proven track record in successfully resolving Citrus County motor vehicle crash cases. Don’t wait to contact us, call us today at 352-726-0078 for a free consultation.